The Mashantucket Pequot Museum & Research Center, part of the government of the Mashantucket Pequot Tribal Nation in Mashantucket, CT, is a non-profit educational institution that seeks to further knowledge and understanding of the richness and diversity of the indigenous cultures and societies of the United States and Canada. A sketch from the car on a visit to Foxwoods Resort for a walk-thru of a potential project. 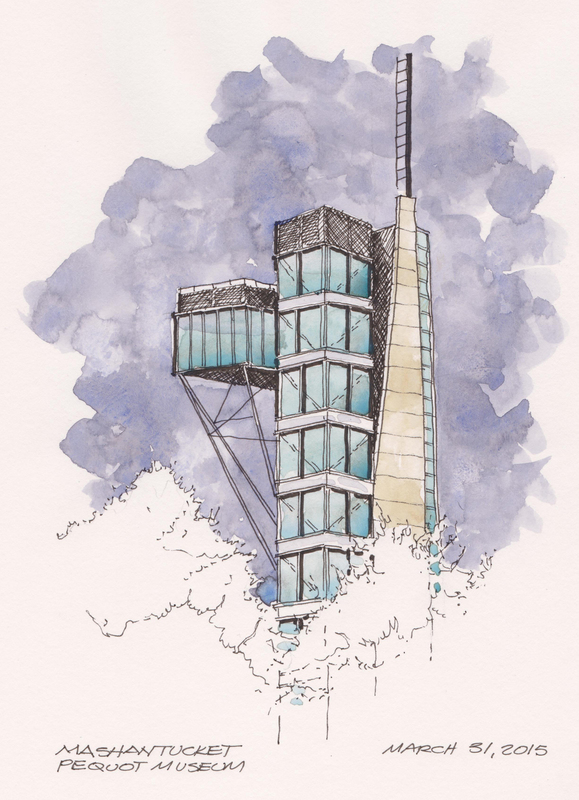 Faber-Castell Pitt Pens, Daniel Smith Watercolors in an Alpha Series Stillman and Birn Sketchbook. Finally a beautiful clear sunny day for a road trip to Cape Cod. The seals were sunny themselves on the sand bars off of Chatham Light Beach (possible future sketch) and people were finally coming out from a long winter hibernation. 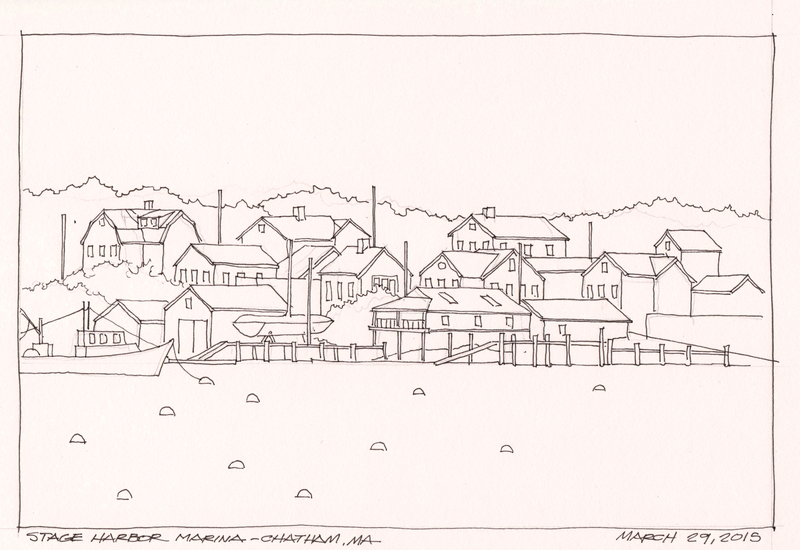 This is a quick line drawing sketch from across the harbor looking towards Stage Harbor Marina in Chatham, MA. Only one fishing boat in the harbor, but the floats were all awaiting in the water for the summer boats. Faber-Castell Pitt XS pen in the Stillman and Birn 9″ x 12″ Alpha Sketchbook. 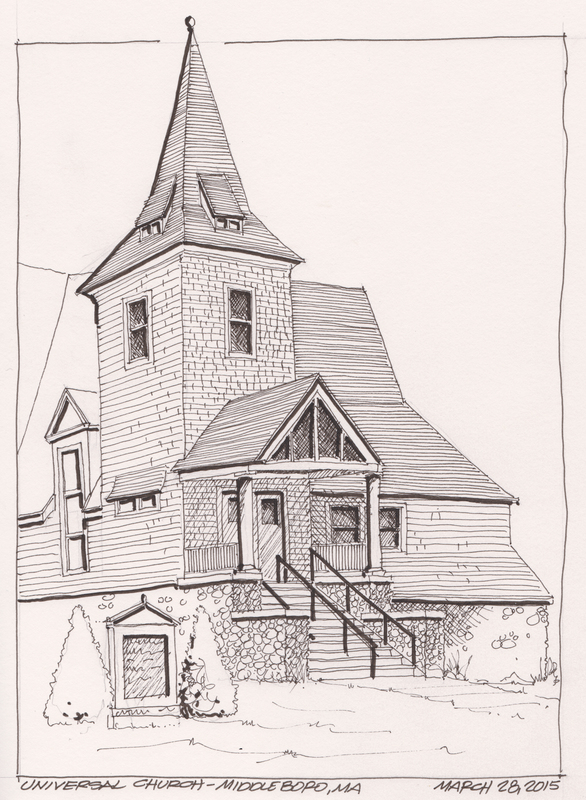 The First Unitarian Universalist Society of Middleboro opened for services on October 26, 1890. In the early 1900s David Pratt gifted us a more central and visible parcel of land on Main Street next to the Town Hall. The church building was cut into three pieces, then pulled by oxen through the streets, and remounted on its current stone foundation with a new porch in 1907. Pen and Ink sketch with Faber-Castell Pitt pens in an Alpha Series Stillman and Birn 9 x 12 Sketchbook. 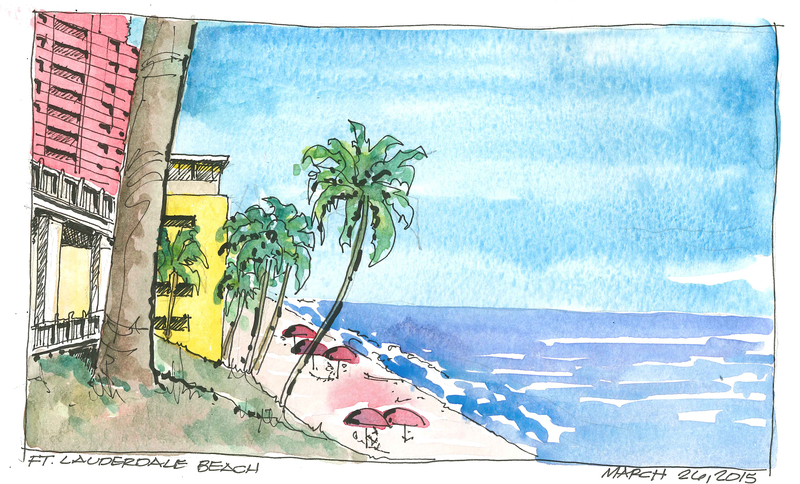 One more sketch from Florida before returning home where Spring still does not want to arrive. Las Olas Street in Fort Lauderdale, Florida is a wonderful walking street with shops, restaurants and great people watching. This is a small Spanish tower on the corner of one of the side streets. 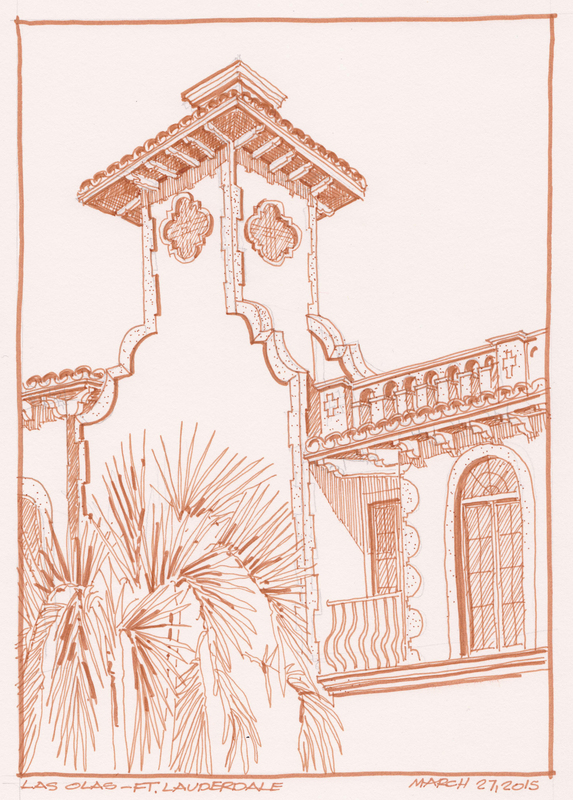 With the stucco and tile architecture, I felt that the Terra Cotta color sketch would suit the architecture best. Faber-Castell Sanguine Pitt Art Pens in a Alpha Series Stillman and Birn Sketchbook. A little down time after way too many meetings. Driving back to the airport we stop at the Pelican Grand Beach Resort for a cocktail on the veranda that is 50′ from the beach. Beautiful views up and down the beach with High tide. This was done later from a photograph. 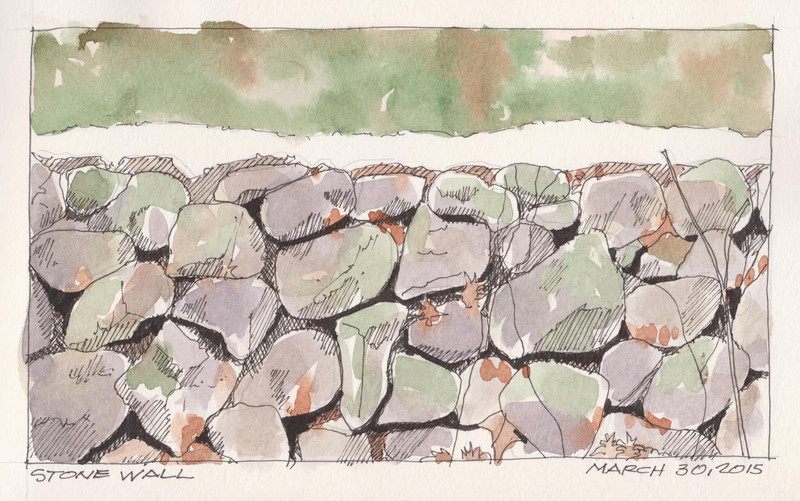 I must improve my confidence in field sketching in busy locations. 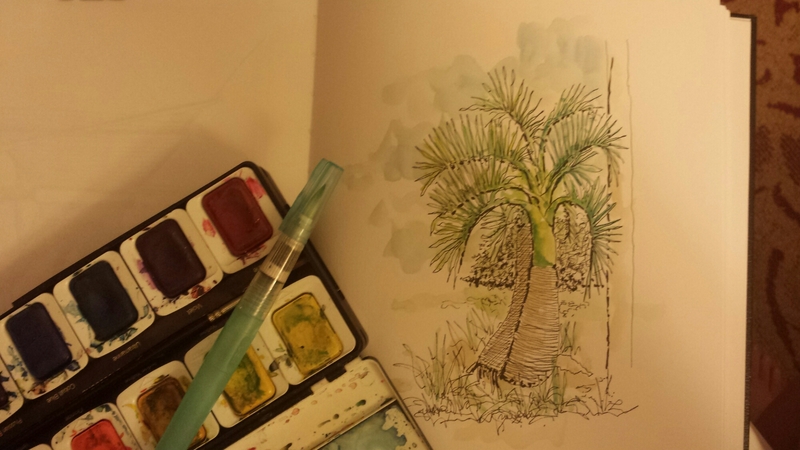 Faber-Castell Art Pens, Pelikan Watercolors in a 6″ x 8″ Moleskine Watercolor Book.